I'm wondering if anybody has had any experience buying a tractor on E-Bay. I've purchased off E-Bay numerous times before, with only one bad result but never big ticket items. Would appreciate any war stories in this regard. I often have people wanting to 'pick my brain' for advice on getting a good used machine at a reasonable price. My advice is always the same, look around the dealers in your area for a trade-in, any potential 'savings' from buying at auctions, etc., are often negated in shipping and mechanical problems. If you buy from a reputable local dealer you at least have someone to go back to if there is a problem later on. If you can't find anything at the dealers, then try the classifieds. I have bid on tractors on Ebay, but I have never won one. I only bid after due diligence and only from someone who has sold and continues to sell tractors. Still...sight-unseen purchases are scary. I have never bought a tractor at a live auction here in the SF Bay Area because people bid way too much for machines with problems. I have watched the local ads steadily for years, yet never have I bought one that way either. I bought the tractors I have from rental companies, and they all needed work. It's a sellers market out there....good luck. With any high ticket item buying at Ebay should be the same as buying at any other place. It should be close enough for you to try it out. If the seller can't accommodate you in a reasonable fashion, then you should probably look elsewhere. I got a ggod deal. And when I went to pick it up I had the right to leave it if not satisified with how it ran. Put be carefull lots of scammers out there!! Yes, any reputable seller should allow the winning bidder to check it out, even after the auction is over. Any good seller on Ebay will exhaustively describe all flaws, in addition to promoting the item. 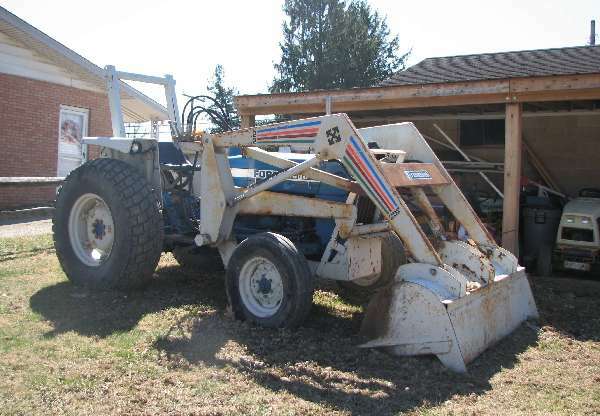 i would only bid on an item close enough to where i could actually go lay hands on the tractor. my other thought on it is. there are many nice folks doing good honest auctions but my luck is if i did bid and win it would be that 1 out of 100 bad apple with the adored tractor i lust for. My belated thanks to those who shared their thoughts. FWIW, most of the feedback was similar to my own conclusions. Guess it's always best to be able to see it, touch it, hear it, and taste it (if that's where your tastes run). I sell stuff on ebay, mostly small garden tractors and equipment. Be very careful who you buy from. If they accept pay pal check to see if they are pay pal verified. If they have good feedback do more and check what Items they have bouight or sold. I know of people who bought from someone with 120 positives and no negatives and all wonderful comments. They were burnt on a $8,000 item to find out the 120 items were 10 cent junk items the scammer bought and sold to build his feedback. Anyone who has you go through a different email because they are having "trouble" with their ebay email is a scammer. If you bid, go to the help and request the memebers contact info and call them if it's a high dollar item. You can nip stuff in the bud tight here if the number is out of service. I put in every description that if you come to see it and don't think it was described you aren't obligated. Email the seller and ask them if they guarantee their description. The best advice I can give anyone on ebay is buy local and DO NOT DO NOT DO NOT wire and $$$ unless you have to and be sure to do it through ebay not outside of ebay. It does not benefit the buyer to do it off ebay. If you buy local, go pick it up and if it wasn't described right refuse it and file a complaint through ebay's square trade. I've got a lot of good deals on ebay but I picked everyone of them up with cash in hand.